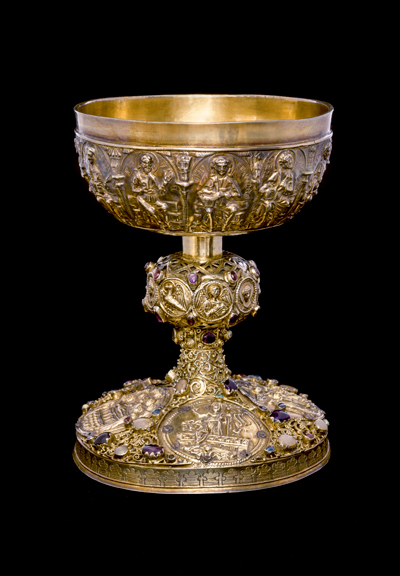 Communion chalice of silver gilt with previous stones, probably made in Westphalia or Saxony in the 13th century. 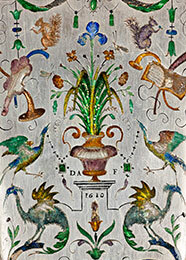 The chalice was presented to the church by Chancellor of the Realm Magnus Gabriel De la Gardie. 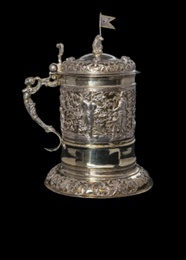 This chalice is richly decorated with precious-stone settings and filigree ornamentation. 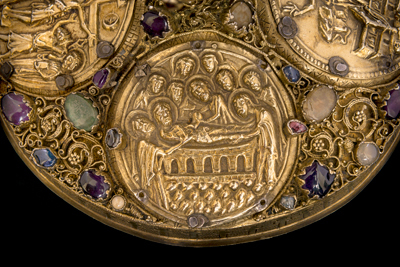 Four medallions on the foot show Christ on the cross, flanked by Mary and John, the Descent from the Cross, the Entombment and the Resurrection. The node is also decorated with a number of medallions, showing among other things a human face, an eagle and a winged human being, all of them probably Evangelist symbols. 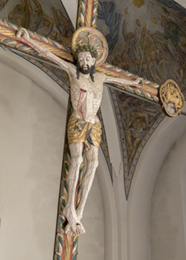 The low, wide cup is decorated with rounded-arch arcades, in which figures of Christ and the Apostles are seated. 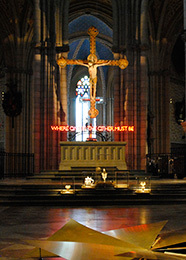 The chalice is a liturgical object, and in medieval times it was classed as a “vasa sacra” or sacred vessel. 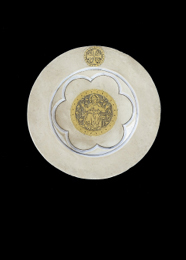 As such, it came into direct contact with the host and therefore had to be made of a rare metal, either gold or silver. 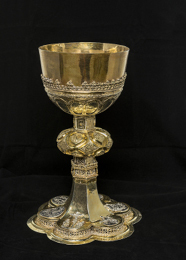 It is unusual for 13th century communion chalices to have retained their original shape as this one has. The low-wide shape is typical of the period. 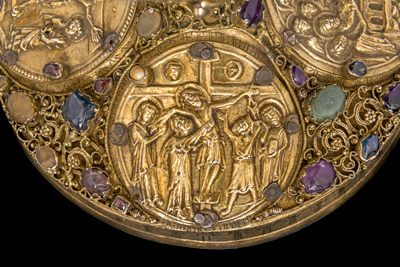 The decorative motifs on the chalice link the death of Christ on the cross, his sacrifice for mankind, with the Eucharist.  This chalice did not come to Veckholm Church till the second half of the 17th century, when it was presented by Magnus Gabriel De la Gardie, whose benefactions also included the church bell and a previous organ case, among other things. His parents are buried here. He had far-reaching plans for turning Veckholm Church into a stately mausoleum church for himself and his kin, but nothing came of them. The chalice now survives as a magnificent token of his beneficence and of his care for the church and parish.